Self-sticking removable labels. Ideal for organizing, scheduling, filing, price coding, etc. 3/4" diameter. 1000 labels. Self-sticking labels feature permanent adhesive. Great for color coding and organizing files. 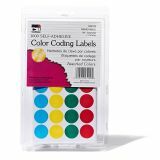 9/16" x 3-7/16", 248 labels. Color coding, assorted colors. 3/4" diamete. 306 labels.